I'd describe the beginning of the study abroad process as signing up for classes, finding a new apartment, and buying a car wrapped together. You hear the term "make or break" thrown around a lot. I won't go so far as to say that a good relationship will either make or break your study abroad experience. But what I will say is that a solid relationship with your advisor will open up little doors that you otherwise may not have known about. They'll go the extra mile for you. We talk discuss this in Study Abroad 201. Your advisors deal on a daily basis with multiple students who are trying to travel all over the world through study abroad programs. And they're good at it. My personal study abroad planning experience is a great example. I first met with my advisor after the spring semester of my junior year. I had no clue what to expect when I went in and, I'll admit it, I came out a little overwhelmed. My first task was to decide exactly where in the world I wanted to venture. We had decided that it would be best to go the spring semester of my senior year so I could stay a little longer into the summer (just because schools' out, doesn't mean you have to be ;-). So the research began. Again, we reference this in other parts of the blog, but doing research for studying abroad is like shopping for something on Ebay - you really don't mind doing it and it is fascinating. The reason I considered Dublin is because my school had an exchange program set up with the top business school in Ireland at the time. My major was management and minor was marketing, making Dublin seem like a good idea. I have been infatuated with Dubai ever since I read Rigged by Ben Mezrich. The fastest growing desert city on the planet, Dubai was nothing but sand 40 years ago. I was so amped on this locale that I even gave speeches on it in school, despite the fact that I had never been there. I thought Dubai would be a unique choice and something that would distinguish me from other study abroad students. It definitely would be a stand-out on my resume. Lastly, I had read about the favorable exchange rate in Buenos Aires, which made it very appealing. What happened was that in 2001 the International Monetary Fund (IMF)) stopped $1.3 billion in aid so a lot of the banks there shut down. A year later, Argentina defaulted on an $800 million debt repayment to the World Bank. Buenos Aires went from being the most expensive city in South America to, arguably, the least. This meant luxurious restaurants, entertainment, and night life would be accessible to me for about 1/3 of what it cost anywhere else in the world. The opportunity to dive into the local culture of your chosen destination is integral to every study abroad experience. I missed out on the opportunity to hop on a bullet train and explore the rest of Europe; access to one of the top business schools and faculty in the world; and, yes, I would have been in Dublin for St. Patrick's Day. Not to mention the food! Dubai would have been amazing, but after doing the research, I concluded that my host school did not have enough infrastructure at the time. Studying abroad in Dubai wasn't as practical and, during the time I would be there, the schools were not adequately equipped to handle foreign students. Remember, this was several years ago when I was in college. I checked and now they're pretty well stacked so if I were a student today, like you, I'd definitely consider study abroad opportunities in Dubai. Read Rigged and tell me it's not a good idea. Buenos Aires ended up being perfect option for me, academically, professionally (thinking ahead), financially, and adventure-wise. I wasn't disappointed. My experiences in South America were phenomenal and I wouldn't trade them for anything in the world. Do you honestly want to know where I think the best place is for you to study abroad? Anywhere. Anywhere on the planet. You're never going to be able to have an experience like this again. So do the research, consult with the advisors in your school's study abroad office, ask your friends and family, and make a decision that you think best suits your passion, major, and wallet. Whatever you choose, I guarantee you won't regret it. where they want to go vs. where they'll have the most professionally valuable experience. You have to weigh the advantages of the location where you anticipate having fun and great adventures in a new culture against those of the location that will eventually help you market yourself to hiring managers. That's asking you to look a bit into the future, but I think it's safe to say that the hiring managers a Sony might be more inclined to bring you on board if you have had experience studying at a host institution in Japan rather than say, Italy. When students have been polled in the past about where they'd like to study abroad, these are currently the top 12. This list changes every year, though. 1. Do you have your heart set on a particular city or country in the world? Maybe there's a locale that's been number one on your "Places I Want to Visit" list. Or maybe you have international roots and you'd like to experience life in the country of your heritage. Thinking about things like this can help you select the perfect place for your study abroad trip. 2. What study abroad programs does your school offer? It's important that you research the programs and destinations that your college or university partners with. Narrowing down your potential options this way may limit your choices somewhat and help you more easily pick a great, yet realistic, location. Just make sure the school you do choose fits with your program and major and will provide the major, core, or elective credits you need. If not, opt for a different program - there's never a shortage of exciting choices for university students in seeking a global education. 3. How important is language immersion to you? If expanding your skills in a particular language is a priority, choose a destination where the use of English is limited. Your classes probably will be in English regardless, but outside of class, the locals you interact with might not speak English much - or at all. Even though this is a great way to learn first-hand, it could be challenging during the times you're not with roommates, classmates, other study abroad students, or your teacher. Consider your main objective where language is concerned. 4. How far will your money stretch in the country you select? Depending on currency rates and living expenses, you'll find some cities will be more financially fitting for you than others. Do some research and have a solid idea how expensive it will be to live in your desired location. How much will it actually cost? You don't want to forego groceries, or miss out on a unique restaurant, or a side trip to another great city just because you can't afford it. This was a big factor in my decision making process. 5. Do you want to travel around while abroad? I'm guessing the answer is an emphatic "yes!" You want to see and do as much as you can. After all, who knows when, if ever, you'll have another chance to live overseas in a foreign country for an extended period of time. If traveling around is important to you, choose a destination that's relatively close, or has relatively easy access to other fascinating places you want to explore. 6. What do you want to get out of your international experience? While studying abroad can put a dent in your pocketbook and alter coursework, don't lose sight of the fact that it will prove to be priceless for future employment. When you are ready to enter the job market, the global experience you have under your belt will give you a real edge over other applicants. I'm sure you can think of many more questions, but honestly answering the ones above will serve as a great starting point as you work on tailoring your unique program. 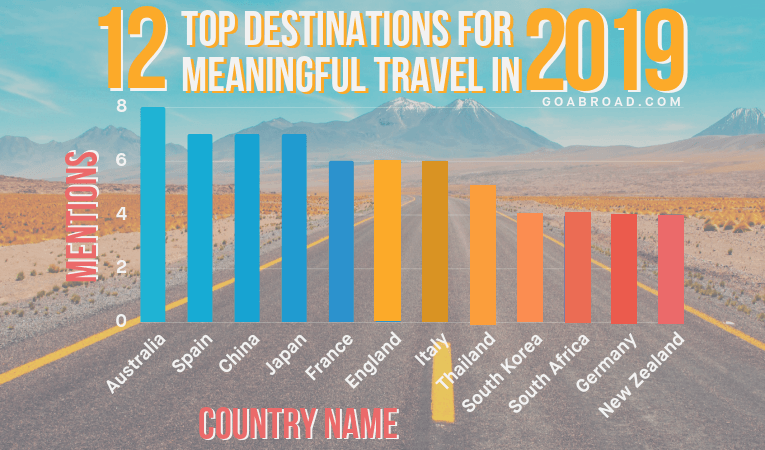 For all international students, factors such as personal likes and dislikes, currency rates, travel options, language goals, and future plans need to be considered because, in combination, they are key to shaping an inspiring experience abroad. So many programs. So many destinations. So many tasks to complete before you actually head out to pursue your overseas studies. If you're organized, the planning will be much easier. The first thing to decide is if study abroad is right for you. It's not automatically a must-do experience for everyone. Sure, studying abroad is an amazing opportunity to try something new. However, it also comes with some challenges like being out of your comfort zone and away from loved ones for a good chunk of time. If that sounds too hard for you to handle, then maybe an international program isn't for you. But if you like traveling to new places and exploring new cultures, if you're comfortable being away from family and friends (remember, you'll make lots of new friends), and if you're looking for an experience that will help broaden you personally, academically, and professionally, then study abroad is a must-do for you. As I mentioned earlier, with so many study abroad destinations to choose among, deciding where to go can be overwhelming. Narrow down the options based on your personal preferences: rural vs. urban setting; English-speaking or heavy into a foreign language; a central location that makes it easy to get around; affordability. You get the idea. Determining the type of setting you like will help you pick the perfect place. It's always helpful to follow up with research about the location you have selected. Online browsing, other students who have lived in your chosen city/country, social media, and of course, your study abroad advisor are excellent resources. Start making plans and doing your research nine months to a year before you actually will depart for your study abroad adventure. This will ensure that you have time to put everything in order and also increases your chances of acceptance into the program you want. Many programs require that you apply at least six months ahead of time. So be ready. Money almost always is a factor when your higher education includes an international experience. But it doesn't necessarily have to be a concern. If you're currently getting financial aid, you may be able to apply that to your study abroad program. Plus scholarships, grants, and loans are available in abundance. There may even be a paid internship in your field of interest. If you need financial assistance, ask for funding help from multiple sources and apply early. Once you have your finances in order, it's not a bad idea to start budgeting and saving for daily living expenses and the extras you'd like to include in your amazing trip of a lifetime. I can't stress enough how helpful your study abroad advisor will be throughout this entire process. Remember those little doors I mentioned at the beginning of this post. By working together with your advisor to open them, you'll be able to decide on a program that's more than perfect for you. If you enjoyed this article and if you like the radio, mosey on over to The Study Abroadcast for one on one interviews with students and advisors who have studied abroad all over the world.